The perfect couple. The perfect house.
. . . The perfect crime. Londoners Jack and Syd moved into the house a year ago. It seemed like their dream home: tons of space, the perfect location, and a friendly owner who wanted a young couple to have it. So when they made a grisly discovery in the attic, Jack and Syd chose to ignore it. That was a mistake. Because someone has just been murdered outside their back door. AND NOW THE POLICE ARE WATCHING THEM. 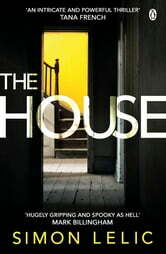 Simon Lelic has written a psychological thriller like no other I have ever read before and it is an awesome read! Truly original and so well-plotted. Basically, this is all about the life of Sydney and her boyfriend Jack who finally manage to buy a home together. This house comes lock, stock and barrel and is stuffed with the previous occupants belongings which they intend to sort through and dispose of 'sometime'. There follows a series of happenings which are creepy and spooky in the extreme - never have I been so glad of not sleeping alone as I was when reading this! I must admit that my heart sank when I started reading as I've never been keen on tales directly narrated to the reader by the characters. However, in this case I can see how necessary it was - well, I can now having read all the way to the end. To be completely honest it didn't take long for the writing style to take a back seat to the story. And, wow, what a story it is! I'm not going to give any spoilers but, trust me, this is one of those novels whose content will stay with you for a long, long time. It always amazes me when, with all the books which are already out there, an author can conjure up something completely original with no hint of connection to any other novel. Simon Lelic has achieved that brilliantly, and I shall definitely be watching for future releases from him. I received an arc via NetGalley in exchange for my honest and unbiased review. Fun! A pacey, one-sitting kind of read. Twisty, but I'm not sure the final twist worked 100% for me. The characters were so much fun to get lost in though that it didn't really matter. A clever plot with unexpected twists from mystery and imagination to sharp thriller. Great story. Couldn't put it down. Lots of twists and turns. Really did not guess the outcome of the storyline. Well worth reading. Very much enjoyed it. A very cleverly scripted psychological thriller with twists and turns all the way through.